Some of my PopCult readers may remember that I’ve shared news of productions by Astral Theatre Collective over the last few years. This is primarily the creative outlet of Lawrence Burgess, an actor and playwright (and theatre impressario on the local scene). They do really high-quality, classy productions, and are an important force on the local creative scene. Last month Lawrence and his wife, Kristen, suffered a devastating house fire. They lost everything they had. Making matters worse, one of their four cats remains missing, and the fourth one did not survive the fire. This is a trying time, and Lawrence and Kristen need a helping hand. 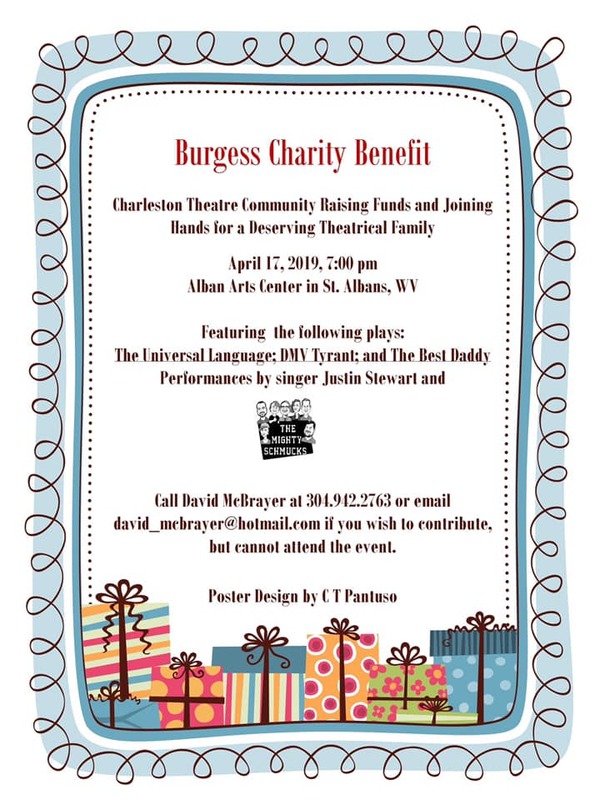 Next Wednesday, April 17, the theatre community will rally around their colleague and hold a benefit show at The Alban Arts Center in Saint Albans. The evening will see performances of three short plays: DMV Tyrant by Christopher Durang; The Best Daddy by Shel Silverstein; and The Universal Language by David Ives. Justin Stewart will provide music, and The Mighty Schmucks will perform improv comedy. This event was organized by David McBrayer. If you are unable to attend and would still like to contribute, please contact David McBrayer via Facebook, telephone at 304-942-2763, or e-mail at david_mcbrayer@hotmail.com. Here’s the flyer for the show. Lawrence and Kristen can use all the help they can get, so if you can, please show your support whichever way you can.